Android has an in-build diagnostic and debugging system known as recovery. Most all devices have built recovery but some manufacturers lock down them. You will need to unlock bootloader and then you will be able to boot into recovery system . Custom recovery are 3rd party recovery system introduced by developers group. 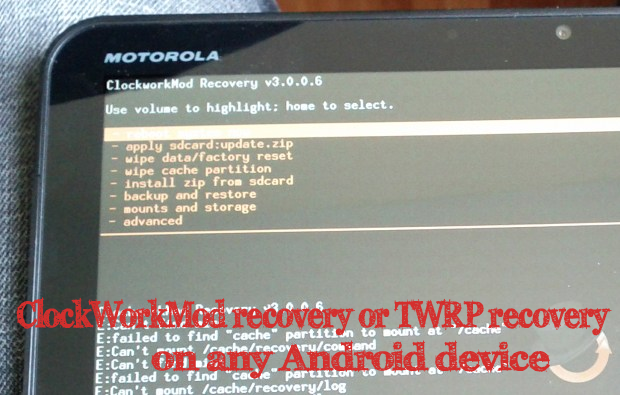 There are many custom recovery available for different devices but the major once are ClockWorkMod and TWRP. Clockworkmod is developed by Kaushik dutta and TWRP is by a “team win” group of developers. Custom recovery has all the basic functionalities of a Stock recovery added with some extra options. You will be able to flash zip file, clear dalvik cache or cache partition, do a factory reset. Once you have rooted your device you can install the Custom recovery to flash ROM, kernel or other mods available as zip files. Developed by a well known developer who has introduced many essential apps for Android users – “kaushik Dutta”. There are key operated and Touch variant of CWM recovery available for different devices. Most of the Samsung and Sony users love the ClockworkMod recovery. Even third party developers have modded ClockworkMod to run on devices that are from Micromax, Lava etc. It’s easy to flash Clockworkmod recovery using ROM manager. Install the ROM manager app from play store on your device. Now, select recovery setup >> Install or update recovery. Just tap on Flash Clockworkmod recovery and it will download and flash the recovery for you. Another way you can flash CWM using Odin or similar flashing application available for your device. This project started as an alternative of key operated CWM recovery. Team Win members decided to create a stable touch based recovery system that will be more useful and easy to use as most of device have touch screens. TWRP is available for limited number devices and third party developers are compiling it for other devices but it’s not stable and fully functional most of the time. TWRP can be installed with the help of a ROM manager like app known as GooManager. Just install the app from the play store and open it. Tap on the menu option “Install openrecoveryscript“. Than Tap “yes” for confirmation, verify the file name and the app will download and install the TWRP recovery. Another way is similar to flashing ClockWorkMod using Odin. You will need to download the zipped recovery file available for your device and flash it to your device using adb commands or flashing tool. You just need to have a rooted phone and then you can install the app. Once you launch it will ask for root access, grant it and go ahead. It will show the options once it detects the device. You can tap on the “Flash ClockWorkMod” Or “Flash TWRP recovery” option to download and flash the recovery.